This map, the oldest map known from Cuzco, Peru features the parishes of Santa Ana and San Pedro. The dense urban fabric, originally planned by Inka founders, is punctuated by churches, monasteries and convents established by Spaniards and Creoles who controlled the city after its conquest. The unknown painter of the map offers a sensitive rendering of Cuzco’s topography, with the hill of Carmenca dominating the top, and ravines at bottom. The map is oriented to the northwest, and follows the main axis, which runs parallel to the right edge of the map, that has oriented the city streets since its Inka foundation. At top is Santa Ana, an indigenous parish church situated on the hill of Carmenca. It was on one of the main roadways into Cuzco and was the beginning point of many processional routes. The great paintings of Corpus Christi processions from the 1680s, one of which is visible in Vistas, probably hung within. The texts on the map are from the 1640s. They label crucial features of the city and were penned by the parish priest who commissioned the map. Along this same axis, adjacent to the plaza appearing in the map's lower right is the monastic complex of San Francisco. It still stands today. Across the street and to the lower left, a rambling convent, defined by what appears on the map as a curved wall, houses the Poor Clares, the sister order to the Franciscans, a building still functioning as such today. This map was created for a lawsuit waged over the boundaries between two parishes in Cuzco, that of Santa Ana and that of Hospital de los Naturales (today, San Pedro). The parish priest of Santa Ana, one Padre Gaspar de Villagra, had the map made to support his position. The painter was most likely a member of Santa Ana parish, which was comprised largely of two indigenous ethnic groups, Cañaris and Chachapoyas. Many from these groups allied with Spaniards in the battle against the last claimants to the Inka throne. Ethnic distinctions marked before the conquest thus continued to shape post-Conquest civic life. The map maker has used watercolor on two pieces of paper, along with an ink that has turned brown with age. The document measures ca. 113 x 57 cm (ca. 44.5 x 22.5 inches) at its largest. 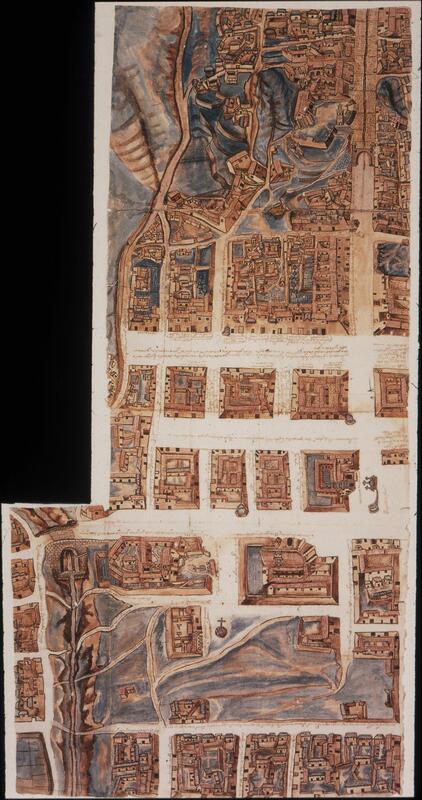 This map shows a section of Cuzco before the devastating earthquake of 1650—after which much of the city was rebuilt. 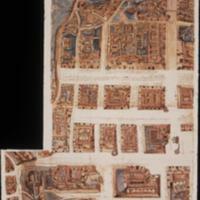 The map was originally made in Cuzco, but sent to Lima as part of the legal process. Today it is housed in the archive of the Archbishop of Lima, Peru. Cities were important loci in the creation of visual culture. Not only did one find rich patrons, both private and ecclesiastical, in cities, but also workshops to train and house artisans. Most trades clustered together in urban neighborhoods like the ones visible on this map, making it easier for them to exchange resources and ideas. Yet this map also expresses social differences with architecture: closer to the center of the map and the center of the city, imposing tile-roofed house compounds dominate, while in the outer neighborhoods, like the indigenous parish of Santa Ana at the top of the map, are filled with smaller houses, with roofs of heavy thatch. Rowe, John. 1989. El plano más antiguo del Cuzco: Dos parroquias de la ciudad vistas en 1643. Cuzco: Instituto Nacional de Cultura.